When I visited the Seychelles, the thing I remember most about introducing myself as an American was that everyone was surprised I’d made it all the way out there. The African island nation is way, way out in the Indian Ocean, a distinct jump off from the well-worn backpacker route that runs from New Zealand up the east coast of Australia into Southeast Asia. Kind of as far away from North America as it’s possible to get. This is not somewhere you’re going to go over a weekend, nor should it be. 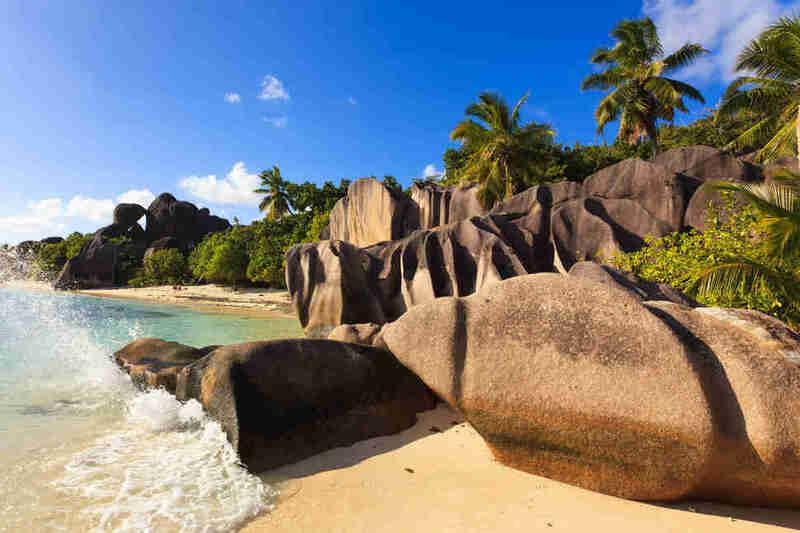 Seychelles is a trip for when you have at minimum a full week, ideally two. This isn’t just because of distance; it’s because the Seychelles are the kind of place your carefully saved vacation days deserve. This is why every other foreigner I saw during my trip was there for either their second or third wedding, but it does not have to be this way. After you’ve booked your flights, your only real remaining cost is the Airbnb of your choice -- you can eat and get around for a few bucks a day. It costs nothing to swim in the ocean, and that is at least 70% of what you’re going to want to do because the water is the most absolutely bonkers color I have ever seen on any water, anywhere, ever. It starts out as that translucent light green color that coke bottles turn when they’re really old, and then as you move away from the beach gets into all these teal shades I’m not entirely sure have names. The other 30% of your modest budget will be food-related, and this is not a place where you have to throw down to get things that taste extraordinary. I paid in loose change for an octopus chapati that I’ve been thinking about ever since. Getting to Seychelles isn’t cheap or easy, but your higher power will reward you immediately and continuously when you arrive. Here’s everything you need to know. If you don’t have an Airbnb account, this is the time to make one. Lots of travel guides hype Seychelles as a place you don’t go without being able and willing to really throw down for luxury accommodations. This is silly. There are some world-class hotels and resorts here, but don’t let their cost intimidate you. The islands are stuffed with Airbnb listings where you can get a lovely room close to the beach that’ll also offer you breakfast, maybe a pool, for around the $100/night range. By no stretch is that budget travel, but there’s a huge difference between saying a place isn’t a budget destination and saying it’s out of reach for anyone who isn’t prepared to drop, like, $10,000 a night. This is the largest island, where the majority of Seychellois live and also where the international airport is located, so unless you have some exciting other form of transportation in mind this is where you’re going to start and finish. In my experience at least, there are (friendly!) dogs running around the beaches, which for many people will be a perk but just something to be aware of if you’re afraid or allergic. 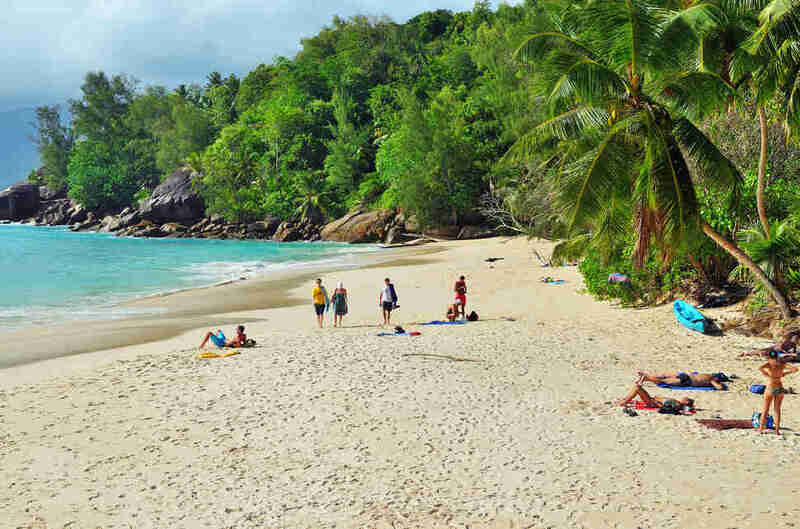 Hike the Copolia Trail (time: about two hours) if you’re outdoorsy, then cool off with a swim at Beau Vallon Beach. If you’re looking to party, Mahe is where you’ll find clubs like Tequila Boom that aren’t a fixture on the smaller, quieter islands. Generally speaking, the northern parts of Mahe are more clogged with tourists, while the southern parts are a bit less-trafficked. You’ll want to spend a morning at Victoria Market, where in addition to various souvenirs and clothing you can get fresh fruits and vegetables (remember this, it will be important later). Go as early in the morning as you can manage, which is just a good rule of thumb for most markets -- the seafood’s fresher, there are fewer tourists, and it’s not yet hot enough to make you impatient that you’re not swimming instead. Praslin is home to Anse Lazio, one of those beaches that wins awards for looking like rich people’s platonic ideal of a beach. Aside from the color of the sand (extremely white) and the water (what I believe those in the nursery-painting business call “seafoam”), both of which are recurring themes throughout the country, a big draw here is that there are zero rocks anywhere on the beach; there’s not even coral, just soft naked sand you can wade out in barefoot without ever having to worry about stepping on anything. Anse Lazio can be a bit of a hike/bike ride to get to, and while it’s absolutely worth it if you do make it out there, don’t stress if you don’t; there are a lot of nice beaches. The other big-name, rock-free beach on Praslin is Anse Georgette, which has the air of being private but actually isn’t. You just have to call ahead of time if you want to visit -- your Airbnb host can likely do this for you -- and walk through the grounds of a private resort to get there. Fair warning, some of the beaches are a little better-suited to strong swimmers, which is how I ended up towing a Swiss couple back to shore with one of those old-school circular life-preservers after the tide started pulling them out to sea. Don’t worry, it’s OK for me to tell this story because A) I don’t want any of you to drown and B) I generally have very few things to brag about. If you can ride a bike, rent a bike and make that your primary form of transportation around the island. 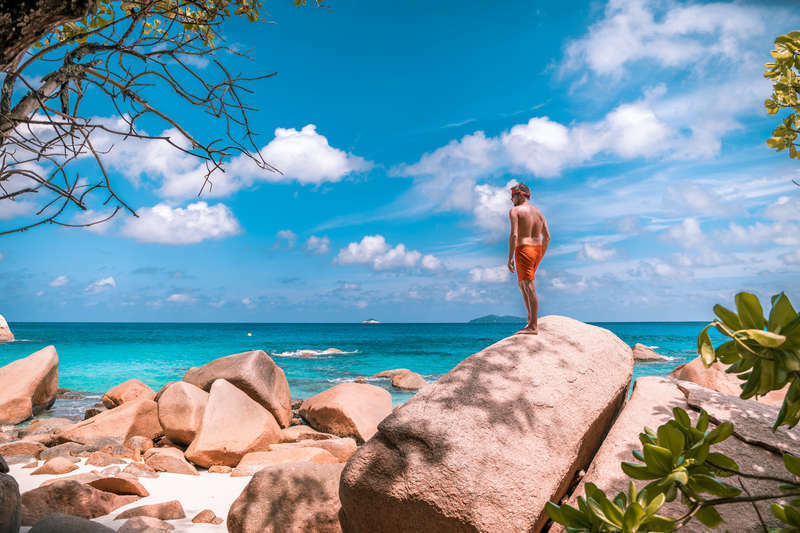 La Digue is a whole is quiet and remote, but you’ll probably still find yourself ducking a few other tourists at Anse Source d’Argent, one of the beaches for which Seychelles is most famous. Bet you thought the sand would be blindingly white here too. Ha, it’s pink. Apologies. As with the rest of the name-brand beaches, this one is obviously excellent, but it won’t make or break your trip so don’t panic if you don’t get there, or if you do but then find it too crowded to bother with. 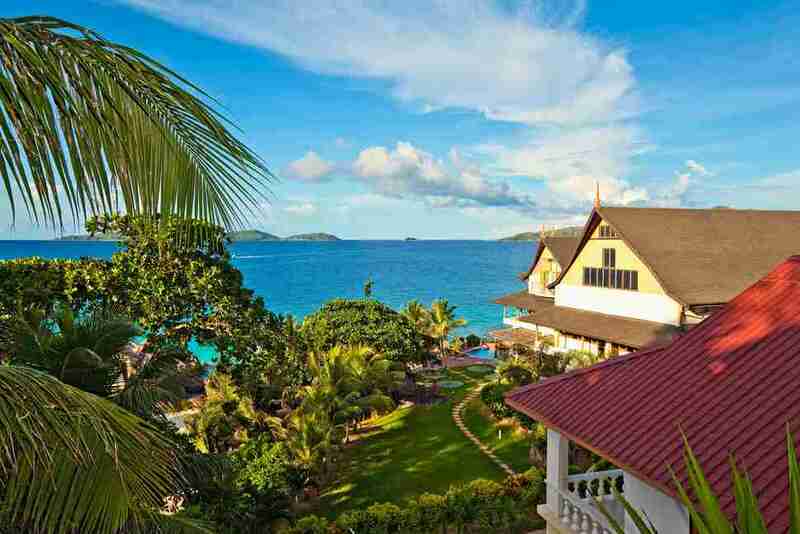 Though a lot of people visit La Digue just as a day trip from Mahe or Praslin, it’s worth booking a night or two there -- that way, in the early mornings before the ferry comes in, you can have Anse Source d’Argent more to yourself. 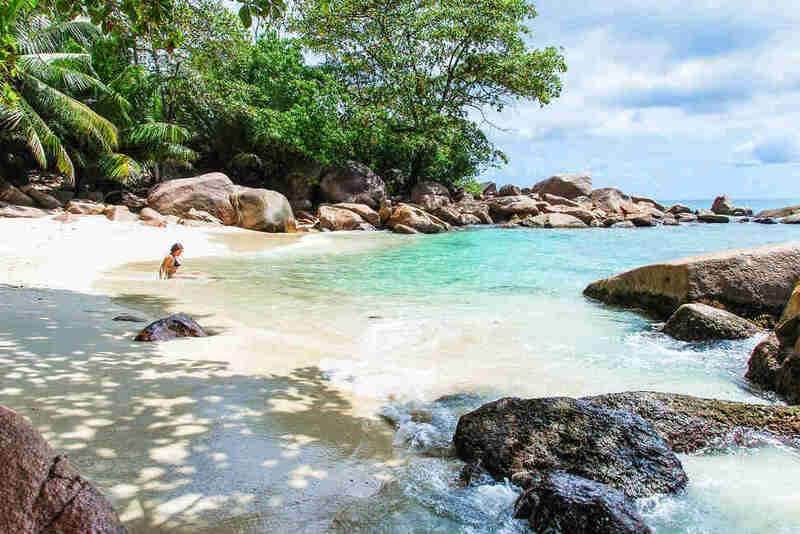 From Praslin, you can take a quick boat ride to Curieuse Island, and from there hike your way to a conservation and rehabilitation center where you’ll find tortoises with shells the size of bathtubs. The only other place they exist outside Seychelles is the Galapagos. You can see more tortoises on Cousin or the coral atoll Aldabra, but the latter is more remote and you can’t just breeze over without booking in advance the way you can with Curieuse. It would be worth taking a boat to Curieuse even it wasn’t a magical dinosaur island, just because the stretch of water separating it from Praslin is so spectacular. Any time you can spend on a boat during your trip is going to be a good time. This part of the Indian Ocean is the only region in the world where Hawksbill sea turtles lay their eggs in broad daylight. Take a boat to Cousin, North Island, or Bird Island for optimal viewing. But you have a good chance of seeing them -- and their tiny progeny -- on beaches around La Digue as well as Praslin, which is where I was swimming when a lone baby turtle, about 3 inches long, bumped into me and we hung out for a bit while it made its tiny determined journey out to sea. Alright, remember the thing I said earlier about vegetables? Produce is often not easy to come by on islands, because they’re islands. 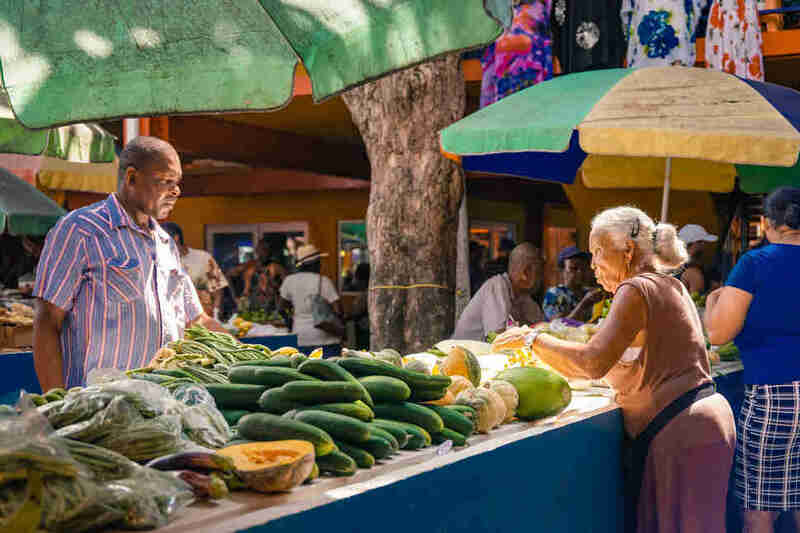 You’ll find some at restaurants, but on places like La Digue, it’s almost impossible to locate veggies that are still in reasonable shape in a grocery or convenience store; locals tend to grow ‘em themselves. You’ll have more luck with fruit, because you’ll probably have breakfast at your Airbnb most days, and breakfast generally means fruit. Enjoy trying to figure out how to eat the little halves of passionfruit as gracefully as possible after realizing they are fun to slurp like oysters. Of course, if you’re eating all your meals at restaurants, veggie access is less of an issue. 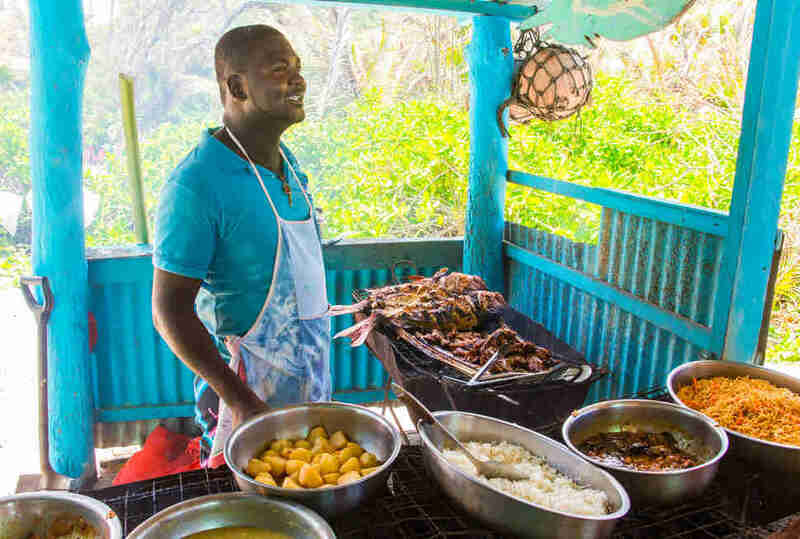 But the best and cheapest way to experience the food is through the many, many Creole takeaway stands, where you get a plastic foam box stuffed with rice, seafood, and green papaya (just try it). You can also pair your dinner with live music at places Boardwalk Bar & Grill on Mahe. And when you want to treat yourself to something a tiny bit more luxurious, watch the sun go down over dinner at PK’s Pasquiere Restaurant and Gastropub. The food was great and the view was really great, but the reason I will remember this meal for a long time is that there was a chutney so delicious I asked what it was made from. At the end of the meal, the waiter emerged with the recipe, written out by hand, on a notepad. Because British colonizers relied heavily on indentured servants, a substantial portion of the country’s population is of Indian descent, and -- as is often the case in these situations -- horrid imperialism resulted in innovative, unique, delicious foods. Anywhere you go on these islands stands to serve you some of the best Indian seafood you’ll ever have. This is where I tried octopus chapati for the first time from a street vendor, and it ruined me for both octopus and chapati in all other forms. 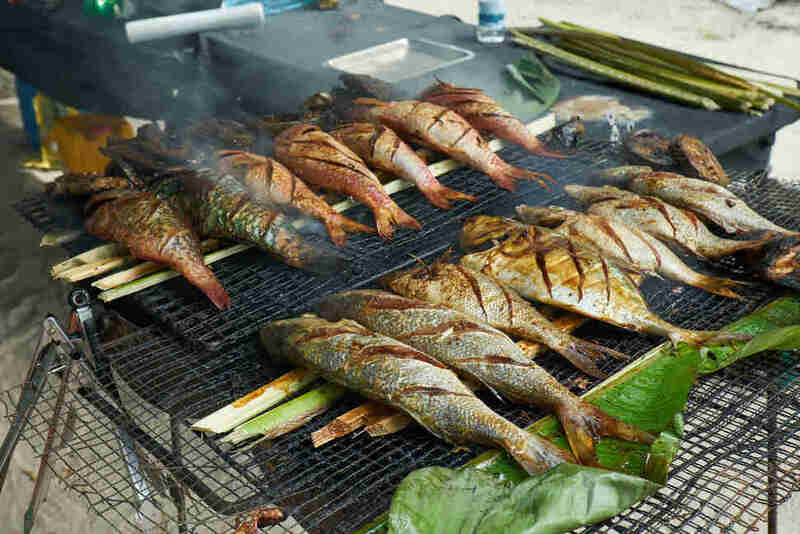 The fish is as fresh as it gets and you should eat it because it’s delicious. As a tip direct from me to you, though, you should also stick to seafood because the landfood (beef and chicken) is almost certainly less fresh, by which I mean flown in from Brazil. The only exception to this is if you happen to be near the ferry port in Mahe and see a vendor selling beef rolls. They have fish ones also, and those are acceptable if they’re out of beef, but they’re not the same. These beef rolls remain among the top 10 things I have ever eaten, and not taking a picture or otherwise recording the location of said beef-roll stall will go down as one of the great regrets of my life. I’m sorry I can’t be of more help; I told you I have very few things to brag about. The stand was reddish I think? If you find it, message me.